Finding a brand that you can count on can be a difficult task when searching for any product, even those as simple as coolers. However, you’re in luck today, because we’re going to tell you everything you need to about Igloo, specifically its Sportsman coolers. This company, which we previously covered, has been ensuring that customers have the toughest cooler ready for any kind of party since 2013, providing features that help whatever items you’re keeping inside be in the right condition for the occasion. 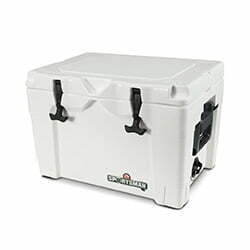 If you want to make sure that your ice chest can handle what you have planned for it, read on in this Igloo Sportsman cooler review. 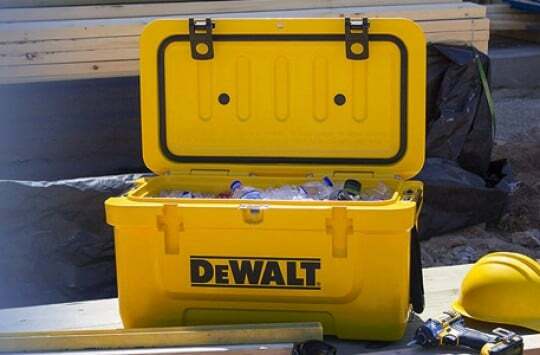 No need to worry about the Sportsman ice chest having trouble dealing with environmental factors like strong wind, rain, hail, gravel and dirt, as this option comes with a roto-molded construction to keep these factors from being an issue. 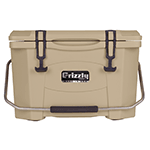 If you end up dropping it while carrying it to the picnic area for a party on the lake or a patio at your friend’s house, you won’t be able to spot any scratches, as the outside of the cooler is basically indestructible. 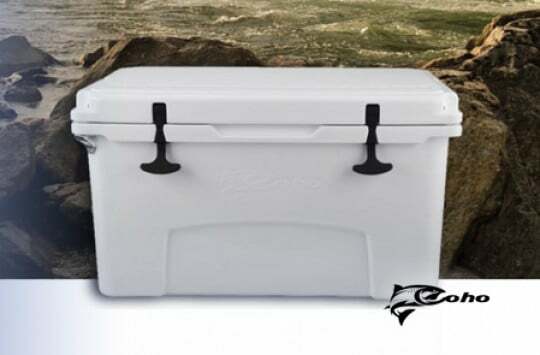 This has gained the Sportsman cooler a great amount of praise in online reviews, with many customers pointing out how well it can handle itself in different situations. If at some point you or someone you know feels like you need a breather and all of the chairs and benches at the get-together are occupied, this cooler is strong enough to act as a seat so that you can catch your breath and enjoy a cold soda or beer. Whenever you’re looking for a new cooler, or your first one, one of the things that you need to make sure it can do is provide cold drinks and frozen meat for barbeques so that no one has to settle for warm sodas or dinners with meat that is not cooked well enough. Thanks to Igloo’s 2 in.-thick foam in the gasket lid and 1.5 to 2. in-thick body foam, you’re items will be in prime consuming condition. If you need extra assurance that you’re ice and items stay cold, the lid latches are secure enough when shut that you won’t have to worry about your items falling out if the cooler is knocked over or if the cold is going to escape and leave you with an ice chest full of melted ice. Getting rid of water and melted ice at the end of the party won’t be a problem, either, as one of the features of this ice chest is a threaded drain plug so that you can empty the cooler in a quick and orderly fashion while keeping it clean. 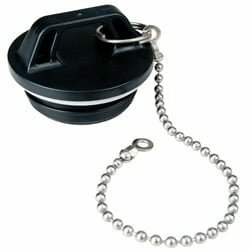 A tether is also included to prevent unnecessary loss of ice. While the size and weight of a cooler can affect how easy a time you have carrying it to your friend’s patio, so does the convenience that its maker provides in gripping it. That isn’t an issue with Igloo, as the Sportsman ice chest comes with swing-up handles on the sides so that you can carry it easily on your own if you have a light amount to bring, or if you bring enough drinks and food for everyone and have a helping hand at your side. While you carrying the ice chest, the side handles help make sure that it stays flat so that your items inside stay still and don’t bounce back-and-forth while you’re walking. This also makes it easier for you to store your items properly if they are of different sizes and you need an arrangement that allows everything to fit in. 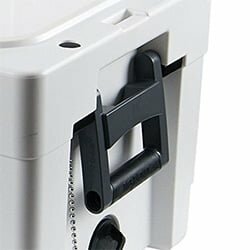 If you’re worried about your drinks and food falling out while you’re carrying the cooler and causing a big mess that you’ll need to clean up, the T-handle lid latches are made of rubber to ensure that the ice chest stays locked. 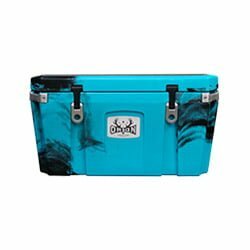 When searching for the right cooler, it can sometimes be easy to mistake coolers that are indestructible have to also be big enough where carrying it to your destination is a hassle no matter how much you’re bringing to the party. Luckily, that won’t be an issue with Igloo’s Sportsman ice chests, because as tough as they are, the weights are 16.5 pounds for the 20 QT option, 23 pounds for the 40 QT option, 26.8 pounds for the 55 QT option and 30 pounds for the 70 QT option. As a result, the difficulty you face in bringing the cooler to the party is all based on how much you’re keeping inside. 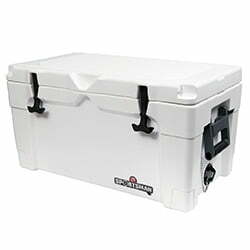 The dimensions of this ice chests shouldn’t get in the way of an easy carry to the patio, either, as the 70 QT option measures 33.2″ x 17.97″ x 18.68″, which isn’t too wide and long, thus making the 20 QT and 40 QT coolers even easier carries. Igloo also made sure that you have plenty of color options in case you want yours to stand out from the rest, letting you choose between White and Tan (all sizes), Pink and Purple Granite (for 20qt) and Realtree Xtra (for 55qt only). The Sportsman’s warranty will keep your cooler free from defects in material or workmanship for five years from the date that you buy it. This puts the brand up there with names like Yeti and Pelican and makes it a better choice in this area than RTIC, which will only keep you covered for one year. 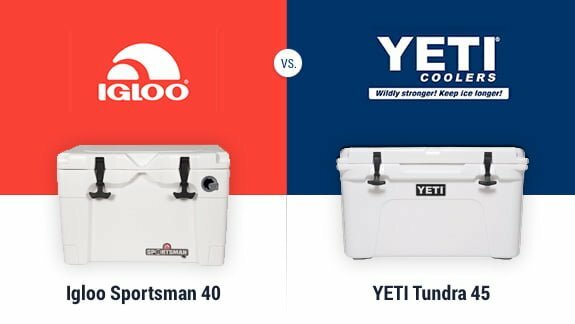 With the success that Igloo’s Sportsman promises in improving the party-going experience, it’s only natural that we compare it to the famous Yeti Roadie and Tundra, which stand above all other brands in the cooler world and became a kind of benchmark products. When it comes to size and the number of beers and bottles you can carry, and Starting with the smallest option, the Sportsman 20QT isn’t too far off from the Roadie 20, which has around the same weight and dimensions. They both have a roto-molded construction to ensure that whatever you have inside is safe and sound and that the outside is free of scratches, dents and other forms of damage that nature has to offer. 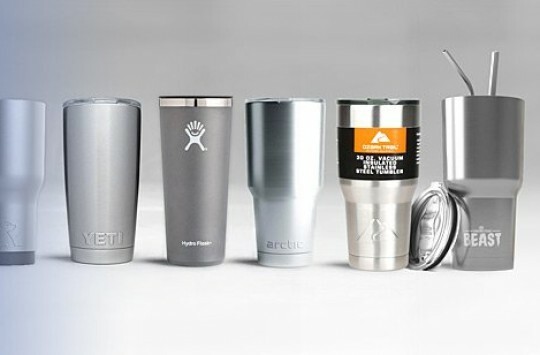 Going up with size, comparisons with Yeti’s Tundra series is where we start to see a lot more differences. While this group offers coolers around the same size as the Sportsman’s, some of which are even a bit smaller, it goes up way higher from there, with the biggest option, the Tundra 350, weighing 89 pounds on its own and measuring 24.75 in. X 23.25 in. X 63.5 in. on the outside. 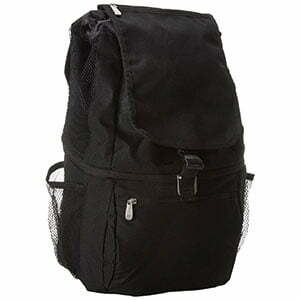 This is because Yeti’s larger offerings are designed for carrying game after a hunting or fishing trip. While the Sportsman is great for use in the outdoors, whether it’s for a camping trip or a party by the lake, it doesn’t have enough room to fit the deer or bass you’re taking home. 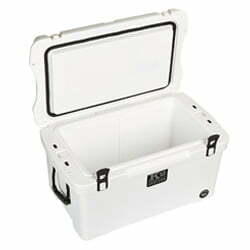 While both Igloo and Yeti are both well known brands, Yeti has the edge in name recognition and tends to be considered as a premium, high-end cooler. However, that shouldn’t stop you from checking out what Igloo’s Sportsman ice chest has to offer, as it can perform just as well in just as many environments. If you’re not a die-hard fan of either option, we recommend checking out which one will give you more of a bang for your buck, as well as consider what you’re going to use it for. If you plan on saving money, we suggest sticking with Igloo or explore other coolers like Yeti. Every product comes with accessories and extra parts that, despite having a separate cost, you just need to get for a complete user experience. For the Igloo Sportsman, one of them is the wire cooler basket, which comes in handy if you want to keep all of your items from getting wet before you give them to guests at a party. The steel, corrosion resistant coating helps makes sure the ice, water and other liquids in cold lockers don’t affect your drinks and food. 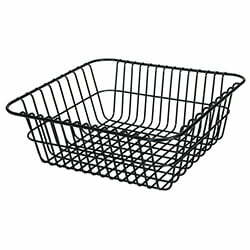 The grid pattern keeps smaller items from falling through, and cool air is circulated through the rack so that your products stay cold. 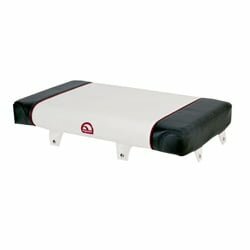 In case you need somewhere to sit if all of the chairs at your party are occupied, you’ll be happy to know that you can get the 55-quart seat cushion, which stays nice and tight on top of the cooler thanks to the stainless steel snaps on all four sides. 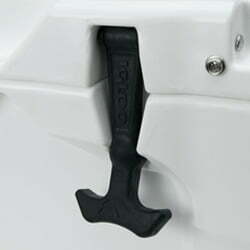 Mounting hardware is also included to add extra security. This cushion focuses on both comfortability and functionality, as it has the 3 in. of foam for a relaxing sit along with water-resistant, heavy-duty vinyl with mold inhibitors to handle the worst of natural conditions, from heavy rain to sun damage. Some coolers are sold with their drain plugs separate, and the Sportsman is one of them, but the Rapidflo Drain Plug makes it worth it. This plug comes with a gasket that can seal tight enough to keep anything from leaking out, and the raised finger grip makes it easy to open and close. The tethered chain makes it easier to take the plug off while the tether screw does the opposite, and the insulated core helps the plug avoid sweating, thus making sure that there’s less to empty when your get-together is over. 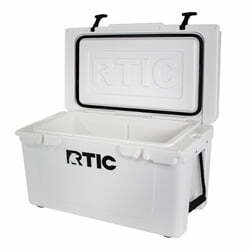 Every successful product comes with competitors that can act as a challenge, and for Igloo’s Sportsman, one of them is RTIC, which makes its coolers usable for similar occasions as those for the Sportsman, including house parties, campouts, hunting trips, fishing trips and get-togethers on the beach. Sizes and capacities are quite comparable here, and as a good example let take a look at the smallest option: the amount of bottles and cans that the RTIC 20 can carry is roughly around the same as that for the Sportsman’s 20qt ice chests, which is 24. 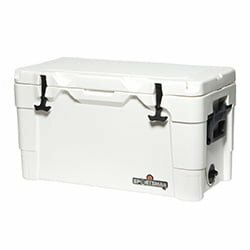 The roto-molded construction is also included to help the cooler handle the worst of weather and natural conditions, and the dimensions are around the same as those for some of the Sportsman coolers. 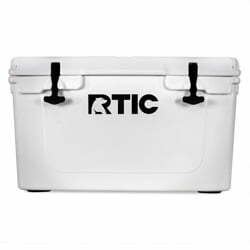 You’ll get 5 to 7 days of cold ice with the Sportsman, but the RTIC is capable of edging out this cooler in the insulation category. Another option that can give the Sportsman a run for its money is the K2 Summit cooler series, which provides options that can match the Sportsman’s ability to deal with rain and hail while avoiding dents and scratches thanks to its rugged, roto-molded construction. 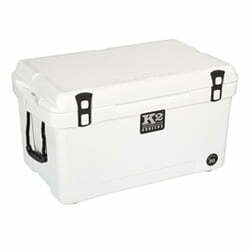 Another similar quality that K2 Summit gives its offerings is being UV resistant, which guarantees that the sun won’t result in you opening the cooler up and being greeted with warm soda and beer. The addition of a shoulder strap (Summit 20) also makes it easy to carry. 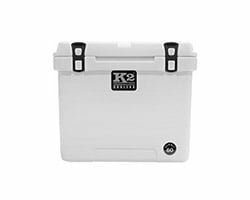 The K2 Summit coolers are a little smaller on the inside than the Sportsman options, which means that you’ll have more luck storing a large number of drinks in the latter. However, it comes with similar straps, drain plugs, latches and other features necessary to keep everything inside cold and secure. Check K2 Summit series on Amazon or read our K2 coolers review for more information. While RTIC and K2 Summit pose a challenge for the Sportsman with similar features and situations for usage, Igloo has a history and proven track record that may make it a more reliable option. We recommend going to Amazon in order to get your hands on the Sportsman, as it has everything you need to make the right purchasing decision, from reviews done by people who have used the cooler in the past to the option to return it if it doesn’t perform as you hoped. If you’re an Amazon Prime member, you’ll have access to free shipping, which ensures that your wallet will stay full. When it comes to finding a cooler that functions as well as you need it to in a variety of situations, Igloo is the way to go, especially if you’re also counting on a more known brand name. Whether it’s a party at your friend’s house, a campout by the lake or a day in the sun on the beach, the Sportsman will make sure that whatever drinks and food you’re keeping inside stays cold. The design and security features with this option ensure that everything inside stays there and that the outside doesn’t have any bumps or scratches on it by the end of the day. If you want these qualities for your next ice chest, give Igloo’s Sportsman series a shot. When it comes to finding a cooler that functions as well as you need it to in a variety of situations, Igloo is the way to go, especially if you’re also counting on a more known brand name. Whether it’s a party at your friend’s house, a campout by the lake or a day in the sun on the beach, the Sportsman will make sure that whatever drinks and food you’re keeping inside stays cold. 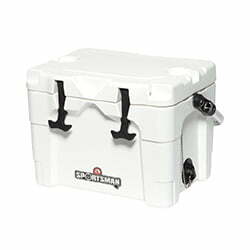 Did you know that Igloo Sportsman Rotomolded Cooler has been Certified as Bear-Resistant by IGBC? It thus joined the established bear-proof coolers club.